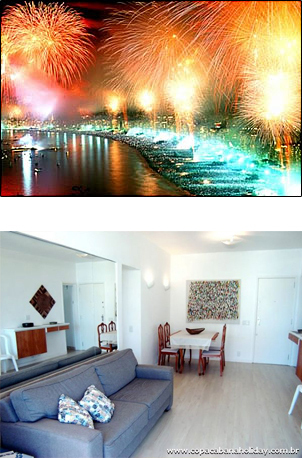 Start your year in style with a magnificent firework display. Come along and take part in one of the most beautiful and memorable parties on the planet in which you, your family and friends and over two million people will all enjoy this wonderful celebration along Copacabana beachfront. Try to imagine a vast crowd of people dressed in white arriving from all parts of the world to greet the dawn of a new year. People from all walks of life united in the spirit of goodwill to mankind walking towards the beach to make their offerings to the goddess of the seas, known as "Iemanjá", and then, on the stroke of midnight, to celebrate with champagne and fireworks. Come and spend New Year's Eve on the most famous beach in the world. In addition to the spectacular fireworks there are numerous shows and events on the beach on this special night, and in the city in general at this time of year.